Plants have been acting differently this spring. Along the coast the peaches have barely bloomed and it's May. Avocado Brown Mite has had a field day. Stethorus beetles have been in low numbers and biocontrol is out of whack. Her ladybug Coccinelid sisters have been in low numbers, as well. There's lots of ladybug species in the coastal area. Usually the first ladybugs show up on the aphids feeding on the malva (cheeseweed) new growth. I haven't seen many aphids on the malva, but for the last several weeks the new growth on citrus has been hammered by green peach aphid (http://ipm.ucanr.edu/PMG/r604300111.html). They have also been feeding on new growth blueberry. This aphid doesn't normally get out of hand like this. Possibly the fires have burned up the hills where they were hibernating this winter? 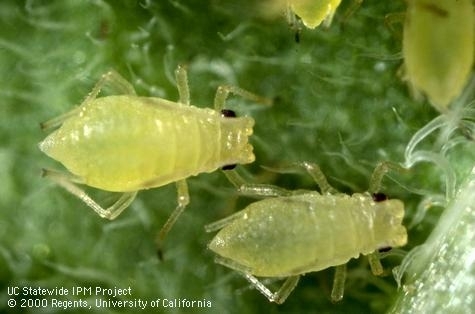 Aphids are not normally a problem in either mature citrus or blueberry. It can run it's course, and something will come in to eat them, but it's interesting how a year can be so different from others. Several Florida blueberry growers have recently reported flower bud damage and corresponding fruit loss, in some cases up to 50% on certain affected cultivars. These reports have focused primarily on Emerald, Farthing and Meadowlark, although other cultivars may have also been affected to some degree. There could be multiple reasons for flower bud damage and the resulting fruit loss, including hydrogen cyanamide and freeze damage. However, in several cases this year it is believed that this type of damage has been caused by blueberry gall midge. High populations of blueberry gall midge in blueberry can result in significant flower bud injury and reduce fruit set and yield. Females lay eggs in floral and vegetative buds just after bud swell. Gall midge larvae then feed on developing leaf and floral buds. 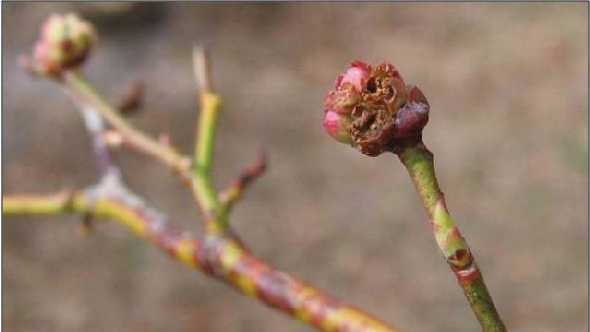 Affected floral buds develop a dry, shriveled appearance and will often disintegrate (Figure 1). Damaged leaf buds are characterized by misshapen leaves and blackened and distorted shoot tips (Figure 2). When the terminal bud on a shoot is injured or killed, shoot elongation growth may be inhibited with excessive later branching occurring just below the damage terminal bud. 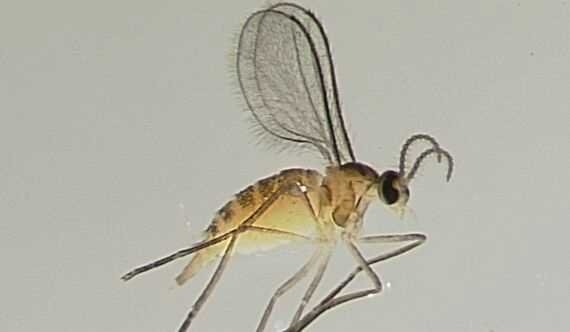 Weather may impact the density of gall midge populations, with warmer temperatures > 60o F resulting in early emergence. Furthermore, re-infestation of previously infested areas is common if management action is not taken when gall midge injury is observed. Growers should be aware of the possibility of gall midge damage in their fields this season, resulting in floral bud death and lower fruit set. Dr. Oscar Liburd, University of Florida blueberry entomologist, is preparing a bulletin to be released very soon with current gall midge management recommendations to be implemented after this season's harvest is complete. 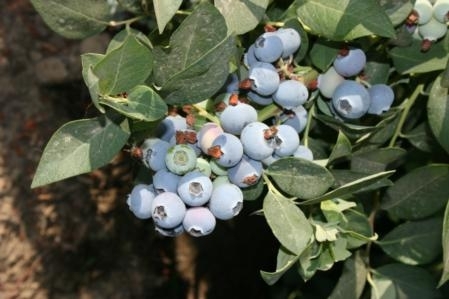 Until this extension bulletin is ready to be published, growers can view pesticide recommendations for gall midge in The Blueberry News magazine. High populations of blueberry gall midge can result in significant flower bud injury and reduce fruit set and yield, Phillips points out. The following are his scouting tips for this pest. Females lay eggs in floral and vegetative buds just after bud swell. Gall midge larvae then feed on developing leaf and floral buds. Affected floral buds develop a dry, shriveled appearance and will often disintegrate. 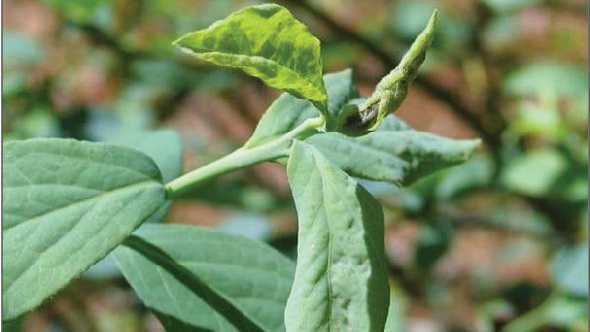 Damaged leaf buds are characterized by misshapen leaves and blackened and distorted shoot tips. When the terminal bud on a shoot is injured or killed, shoot elongation growth may be inhibited with excessive later branching occurring just below the damage terminal bud. Weather may impact the density of gall midge populations, with warmer temperatures (greater than 60°F) resulting in early emergence. Furthermore, re-infestation of previously infested areas is common if management action is not taken when gall midge injury is observed. Is this something that California growers should be concerned about? To my knowledge these midges have not been reported in California. We also don't use hydrogen cyanamide which may be contributing to the problem. With plant material and people moving around, though, it might show up and be a problem. I never thought blueberry rust would show up in California, but as the crop has become more widespread, it has showed up. Ever alert. 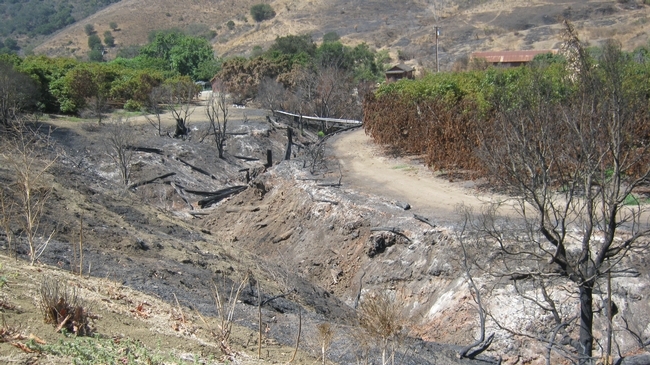 It's important that California avocado industry members who have been impacted by the recent wildfires and/or Santa Ana winds contact their crop insurance agent within 72 hours of the event to determine possible applicable coverage. Both fire and wind events may be included in certain crop insurance coverage, but agents must be notified within 72 hours. The Tree Assistance Program provides financial assistance to qualifying orchardists to help them replant or rehabilitate trees damaged by natural disasters (separate from crop insurance). The Emergency Conservation Program offers funding and technical assistance to growers to help them rehabilitate land damaged by natural disasters. This program may provide cost share assistance for debris removal, land leveling and shaping, irrigation replacement, and cattle fencing. Emergency loans are available to producers located in counties that receive a primary or contiguous disaster designation. A complete list of FSA disaster assistance programs can be found online. For more information about available disaster assistance programs, contact your local U.S. Department of Agriculture office. You can find your local USDA service center by clicking on this link. The AMS Specialty Crops Program helps buyers and sellers of all sizes in the U.S. produce industry to market their perishable products in the most efficient manner. They partner with State agencies and other industry organizations for the benefit of nationwide growers, shippers, brokers, receivers, processors, retailers and restaurants, direct to consumer sales, and the foodservice industry. 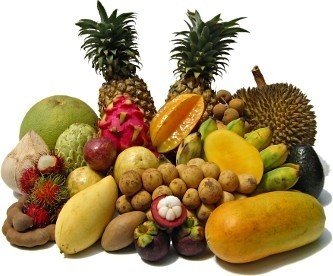 The program offers a wide array of services that span from helping market the quality of products to ensuring that there is fair trade in the produce industry. The program also helps specialty crops growers and handlers to combine their resources to help their respective industries overcome marketing barriers. The USDA Specialty Crops Program also has a food safety certification program that might be of help to growers. In April 2016, the Specialty Crops Program's Specialty Crops Inspection Division (SCI) launched GroupGAP, a new food safety certification program that is part of our USDA Good Agricultural Practices (GAP) suite of services. Our voluntary USDA GAP programs help verify that produce growers and handlers have taken measures to reduce the risk of contamination. Commercial buyers look for USDA GAP-certified suppliers to source safe specialty products. While larger operations can devote the resources needed to become GAP certified, some smaller entities cannot. Until now. GroupGAP allows farmers, food hubs, and marketing organizations of all sizes to band together and pool resources to achieve USDA GAP certification.